President Barack Obama’s European tour will include, not surprisingly, an audience with the Queen of England. 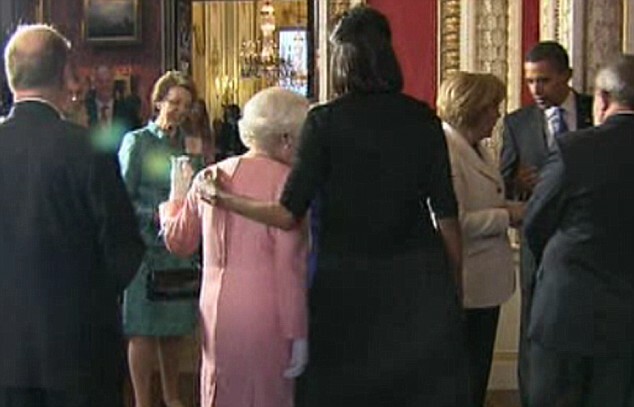 Obama, joined by the first lady, will have lunch with Elizabeth II on Friday at Windsor Castle. Obama will touch down outside of London on Thursday evening after two days in Saudi Arabia, where he held what White House officials described as a series of blunt meetings with Sunni Gulf Arab leaders about Iran, Syria and the Islamic State. For all the expected talk about the U.S.-U.K. "special relationship," the visit won’t be all cakes and ale. Nile Gardiner of the Heritage Foundation wrote in a blog post that Obama is “no friend to Britain.” He predicted some potentially awkward moments, especially over the prospect of Britain exiting the European Union. The Daily Mail called the embrace “absolutely extraordinary.” It was a major break with protocol, which has long mandated that no one is to touch Her Royal Highness. And even though reports say Elizabeth initiated the embrace, the first lady received ample criticism on both sides of the Atlantic for returning the gesture. Evidently the two countries&apos; relationship isn&apos;t that special. The United States might be an offspring of Great Britain but when it comes to national pastimes, the apple fell a long way from the tree. As evidenced when President George H.W. Bush took the royals to grimy, aging Memorial Stadium in Baltimore on a spring night in 1991 for a Baltimore Orioles-Oakland A’s game. The 41st president dressed down, a bit, wearing slacks and a blazer. But the Queen did not, standing on the field in an elegant red and black dress, a triple-strand pearl necklace and black gloves. In several pictures, the Duke of Edinburgh was caught gazing rather bemusingly at Bush as he waved — with both arms thrust straight into the air — and at the Baltimore fans way up in the cheap seats. The scene was vintage Ronald Reagan. It was big and bold — but with a touch of class and even humor. On a memorable June day in 1982, the 40th president and the queen, dressed to the nines in formal riding attire, mounted dark brown horses at Windsor Castle. The University of Virginia’s Miller Center even included one shot from their ride in its Reagan photo gallery , which covers his eight-year presidential tenure. 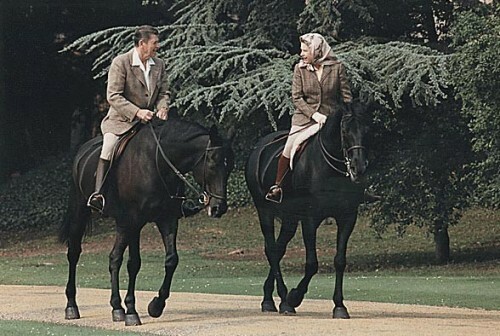 In several images, Reagan can be seen leaning over in his saddle laughing at something Elizabeth has said. The pair shared an affinity for horses, with the former keeping Arabian horses in California and Elizabeth having ridden them since childhood. Still, world leaders have long posed awkwardly for the cameras, making the Windsor ride unique. Q: Which U.S. president holds the distinction as being the only one during Elizabeth’s reign to have never met her? A: Lyndon B. Johnson.